The edges of old maps, the gateways to parts unknown, are often said1 to have carried the words “Here Be Dragons”. At the dawn of the Scientific Revolution, there was plenty of room for those dragons to roam. Each human culture around the globe was surrounded by a fog of geographic and metaphysical unknowns. Since that time, science has destroyed the habitat of those dragons in a steadily process 2. The central question of Matt Kaplan’s book, The Science of Monsters, is really focused, not on the monsters, but on us. Why did we populate that fog of unknowns with fabulous creatures that evoked fear and awe? Do we still tell similar stories after the fog has been lifted? If we do, how have the stories changed to reflect our new reality? The Science of Monsters is ultimately about our favorite monster – us. Good fictions convey truths about the experience of being human. Imagine yourself thousands of years ago. What experiences would inspire you to tell your children a tale about gigantic lion with impenetrable skin or a creature with snakes for hair, whose gaze turns mortals into stone? What were the experiences these stories of monsters were meant to convey? The Science of Monsters uses exemplar monsters to present the variety of potential explanations for our continued dedication to these stories. The Science of Monsters is at its best when channeling Adrienne Mayor’s The First Fossil Hunters to explain monsters as first, naive attempts to explain incredible discoveries like mammoth tusks and dinosaur fossils3, and when focusing on expressions of our own psychological foibles. In this context, we explain the mysterious – a jumble of gigantic bones, a rock formation that could not possibly have been created by random, natural processes – as a combination of matching the unknown to the known, giving in to our human instinct to assume causal agency in chaos, and grappling with our fears. 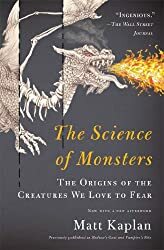 The Science of Monsters is weaker when attempting to explain mythical monsters as potentially authentic, if exaggerated, experiences of real creatures. As Kaplan notes is some cases, the biological explanations are both speculative and implausible. In our experience, mutations leading to unusually large specimens cause serious health problems requiring medicine and social support to survive, hardly the stuff of nightmares. Similarly, the rate of shark attacks on prehistoric humans needed to cause a fear of sharks to be hardwired into our neurobiology is unimaginably high3. As we follow Kaplan through the monsters of history, we discover that the relentless progress converting unknown into known has not killed off all the monsters – they have evolved to fit their new environment. In our myths, we have replaced the gods as the source of monsters. The gods stood in for nature and the monsters were, then, an expression of the terrifying unknowns of nature. Now, they are an expression of the terrifying unknowns within ourselves and our potential. We have filled in the edges of our maps of Earth, but our souls still carry the words “Here Be Dragons”, promising that our monsters will evolve with us and never go extinct. DISCLOSURE: We were provided with a paperback copy of The Science of Monsters by the author and publisher for review. 1. It is not clear that many maps ever actually said “Here Be Dragons”, but I suspect the sentiment is not far off. 2. And, of course, literal habitat destruction of literally not-imaginary animals too. 3. Based on a decade old memory, Mayor’s treatment of the interpretation of fossils by ancient Romans, Greeks, and other societies is more focused and in depth on this topic. The First Fossil Hunters is the classic of this field among books written for the general public. Mayor provided a positive, back-cover blurb for my paperback edition ofThe Science of Monsters. 4. Evolutionary arguments are often used in these kinds of situations, becaue we have, justifiably, great confidence in the power of evolution. Thanks to evolutionary theory and quantitative genetics, however, we can understand the parameters necessary for that power to generate results. Neurological hardwiring requires variations in many genes that predispose toward that behavior to exist in a population. The selective pressure required to “hardwire” fear of sharks in a relatively small population in an evolutionarily short time period would need to be extremely intense and, frankly, sharks aren’t that dangerous to humans even when we are around the water all the time. The most intense area of attacks Kaplan cites with modern population sizes averages less than 2 attacks per year. Intense selection that is not. This entry was posted in Curiosities of Nature, Follies of the Human Condition and tagged Adrienne Mayor, Book Review, Matt Kaplan, monsters, mythology, Scribner, The Science of Monsters. Bookmark the permalink.